Please tell us if you have any access requirements at the time of your booking. By letting us know your requirements we will, where possible, seat you appropriately. Bridgewater Hall staff are here to help; please do not hesitate to approach any staff member for assistance during your visit. The main entrance and Box Office entrance of The Bridgewater Hall both have level access from Lower Mosley Street. Automatic doors are situated at the Box Office entrance; these are open during daytime hours, but exit-only on concert nights. Please use the main entrance on concert nights, where staff will assist with doors. Bags are searched and a number of items are prohibited; you can contact us if you need to bring a prohibited item for access reasons – see our Security page for more information. Access to and from the NCP Manchester Central car park is by lift or ramp between Barbirolli Square and the canal basin and covered walkway under Lower Mosley Street. More information about disabled parking can be found below. 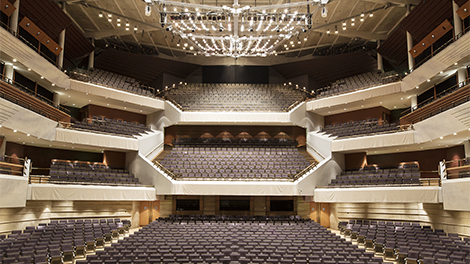 The Bridgewater Hall has step-free access into the auditorium, meeting rooms, restaurants and bars. All floors are accessible via a lift. Please see below for information about accessible seating in the auditorium. All bars and the Box Office have low level counter positions. A low level public telephone is situated near the Box Office. An accessible toilet is available on each of the Hall’s four levels. The accessible toilet on Choir Circle (Level 2) has a sliding door. There are 16 wheelchair spaces located in various level access areas in the auditorium, with spaces on each level. Level access seating is located throughout Stalls, and in specific areas only elsewhere in the auditorium; please ask for advice if you would like to book level access seating in the upper levels of the auditorium. Please note that Stalls level is on a gentle incline, sloping down from the back to the front. Please let us know if you require level access plus additional requirements such as extra leg room, an aisle seat or space for a guide dog/assistance dog. We offer a wheelchair loan service (subject to availability) to help patrons to and from their level access seats; please note this does not include staff assistance and anyone borrowing a wheelchair must be able to use it independently or have the assistance of a carer or companion. Please request a wheelchair when you make your booking. The front rows of the stalls area offer the best viewing opportunities for patrons with impaired vision. Guide dogs are welcome throughout the building and auditorium. Dog mats are available on request and the Box Office can advise on the most suitable seating. Lifts have voice announcements and raised lettering on the control panel. All stair landings have raised lettering with directional information. The Hall’s what’s on information is available in large print format. If you would like to receive information in large print, please contact the Box Office on 0161 907 9000. Any of these aids may be borrowed from the cloakroom on the ground floor foyer. Please ask if you need further information about the system, or read the document available as a link on the right. Hearing and assistance dogs are welcome throughout the building and auditorium. Dog mats are available on request and the Box Office can advise on the most suitable seating. There are a limited number of complimentary disabled parking spaces for blue badge holders at NCP Manchester Central, allocated on a first-come-first-served basis. Spaces are free of charge but a ticket must be booked through the Box Office with your concert tickets. This arrangement is not available to those attending Midday concerts or private events at the Hall. A wheelchair drop off point is located on Lower Mosley Street outside the Hall. We must stress, however, that this is not a parking space, even for blue badge holders. Double yellow lines at the rear of The Bridgewater Hall on Great Bridgewater Street allow parking for blue badge holders except during the hours of 6.00–8.00am and 4.00–6.00pm.